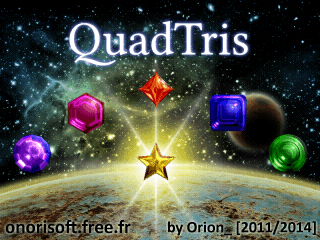 QuadTris is a puzzle game, playable on the GP32 console. The game was created in less than 24 hours for the "speed coding" contest held at the retro computing convention AC 2011, the 16th and 17th April 2011 at "Congis sur Thérouanne" France. You have to match at least 4 blocks of the same color in a square or rectangle form. For this you can rotate the blocks 4 by 4 using a cursor and the A button. As the level increases, new colors appear as well as bonus and penalties. 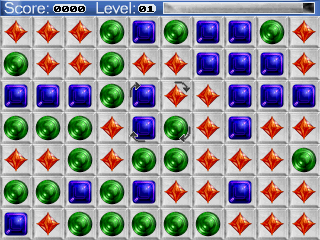 -If you blow up a block with the "Bomb" symbol, all the blocks of the same color will explode. -Some Leafs can appears on the board and interfere with your game. -A block containing the "Lock" symbol will locks the rotation of the block. -A block containing the "Arrow" symbol will reverse the rotation of the cursor. -Added Title and Gameover screens + HiScore. -The "leaves" particles now disappears smoothly. -Removed the explosion particles that was ugly.